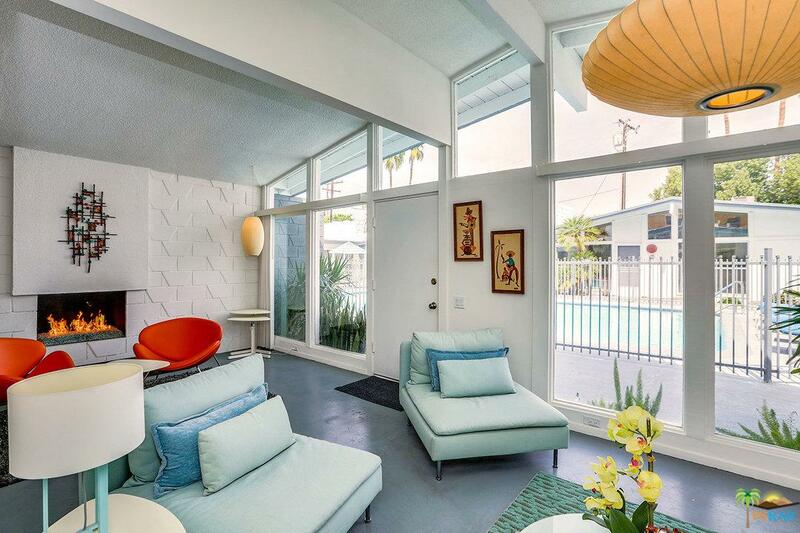 Discover Calypso Palms, a quaint mid-century modern community of 12 units located in South Palm Springs, steps from the famous Purple Room Supper Club ! This one bedroom and 2 bath unit is one of the best at Calypso Palms! It offers a fabulous living area with with decorative block walls and clerestory window that bring amazing light into the unit. It also has a meticulously maintained vintage kitchen, a nice gas fire place in the main room to enjoy the chilly winter evenings, a full size private patio with mountain views, and, best of all, this unit comes fully furnished (art is excluded)! The low monthly HOAs include trash, water, insurance, seasonal heating of the pool, and exterior grounds. Contact agent for private showing.